EFORE THE CAMPION MISSAL could be published, it was necessary to collect, scan, sort, clean, and carefully digitize more than 300 religious line art drawings. Credit for this goes to Kristen Ostrowski, who combed through hundreds of 19th century Missals, Antiphonals, Breviaries, and Graduals from a Benedictine Abbey, meticulously extracting pictures that were still intact. The St. Edmund Campion Missal & Hymnal for the Traditional Latin Mass (ccwatershed.org/Campion) contains approximately ninety (90) of these exquisite “woodcuts.” In my blog entries over the next year or so, I will be releasing hundreds of these pictures for general use by Catholics everywhere. 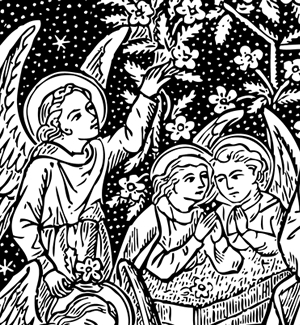 The artist seems to have thought a great deal about what each angel is doing. You will notice that the quotes are given in both Latin & English — a special feature of the Campion Missal we hope will be appreciated. * To learn more, you may want to visit the Campion Missal website [url].